There’s new evidence that the number of people reporting medical debt issues is declining, and new federal rules are aimed at curbing aggressive collection practices for low-income patients. But medical debt still accounts for half of the collections posted on credit reports and is the largest source of complaints about credit reports, exceeding complaints about utility and cable bills and retail and financial transactions. 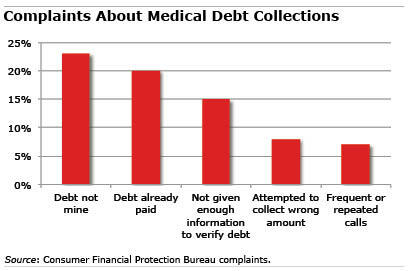 Consumers also pay more when medical providers refer bills – even those sent in error – to collection agencies. A $100 past due bill can reduce a credit score by more than 100 points, leading to higher interest rates on mortgages and credit cards or even a denial of credit. Another issue that raises questions about the validity of medical billing and collection practices, CFPB said, is that many people with medical bills on their credit reports don’t have other financial issues. In some cases, CFPB said people don’t pay their bills on time because they’re confused about what they owe. In a new policy, the CFPB now requires each credit rating agency to make regular “accuracy reports,” which include, among other things, a list of the organizations that refer the largest number of consumer disputes about medical debts to the agency during the reporting period. To file a CFPB complaint about a medical billing error, click on the “Debt Collection” tab here.